What happens when teens from St. Louis neighborhoods come together with cameras, microphones, and laptops at UMSL Grand Center? OneCity Stories welcomed high school students, partners from St. Louis media businesses, and teachers to establish a new publishing outlet for St. Louis youth. Besides the thirteen youth writers and the dedicated staff, three transformation points contributed to the evolution of empowered teen voices at OneCity Stories. “Dream big!” encouraged Gateway Writing Project site directors at a planning retreat in January 2015. Teacher consultants envisioned a media journalism program of high school youth from different neighborhoods, economic backgrounds, race, and ethnicity sharing their stories about growing up in St. Louis. GWP’s youth writing committee began a year and a half preparation to launch OneCity Stories for June 12- June 30, 2017. With funding from the 2017 LRNG Innovators Challenge Grant, several teens received scholarships. Media partners and teachers introduced journalism skills the first week, broadcasting the second, and cinema the third. Five St. Louis media businesses participated, including St. Louis Post-Dispatch, St. Louis Public Radio, Cinema St. Louis, KDHX, and NineNetwork. Artists from UMSL’s MFA Department volunteered to work with teachers and business partners. 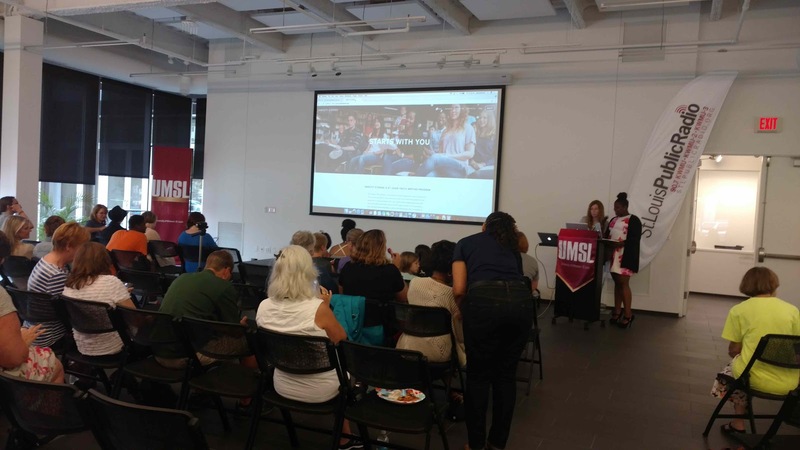 The collaboration between UMSL, media partners, writing project sites, and teachers established OneCity Stories as a springboard for St. Louis youth to share their voices. After the second planning session, the UMSL creative writing artists, sensing a shift to a journalism emphasis, resigned. Yikes! Deep in our GWP hearts we knew student choice motivates teens to write and to access critical thinking to develop the story deeper. On their applications teens had expressed the desire to have time for creative writing. Although the schedule included appropriate steps for learning media skills, it lacked opportunities for creative energy. With intention we added creative writing lessons and student choice alongside journalism lessons. A new artist-in-residence from UMSL’s MFA program joined the six teachers who would participate. Students experienced poetry by Rita Dove and Ross Gay, six word memoirs, and songs, besides lessons on interviewing and camera angles. For each writing assignment students chose their genre and revised the piece of their choice. Just as guest speaker MK Stallings from Urbart emphasized the potential for youth connecting with the arts, creative writing models empowered our writers with choices to express their voices. podcasters of We Live Here, a St. Louis-based podcast about race and class. Students viewed two racial/ethnic perspectives different from their own at New York Times Conversations about Race. Interviews with each other about Ferguson began with these starter questions: What were your conversations about race (with family, friends, co-workers) in St. Louis prior to Ferguson? How did Ferguson affect you, your family, etc.? What, if anything, do you think will come out of Ferguson? Next we held a conversation about race in our classroom. We observed the teens even setting aside devices as they listened and spoke earnestly about their school’s racial climates. This honest dialogue about racial and ethnic experiences in other St. Louis schools convinced the writers that their experiences mattered and jump-started writing that would reveal their stories. We had envisioned the race conversations bringing the writers together in a climate of trust. While students walked to lunch in integrated groups, they ate lunch segregated by race. We cringed at overheard misconceptions about economic experiences different from their own. Some writers did share their pieces eagerly, but others did not share in their writing group, group sharing, or one-on-one conferences. How could we lead them to trust enough to share their writing? The day before the final celebration, one shy writer asked to emcee. Would she follow through? On Friday morning, she left the room to return wearing a summer dress, snappy sandals, and a wide “I’m ready” smile. Stunned at her physical transformation from a timid writer to our eager emcee, we hoped her confidence would touch the others. As I scanned the audience of forty people including writers and staff sitting next to parents and friends, I held my breath. With poise our teen emcee proudly shared her podcast, then graciously introduced each writer who shared one piece. Although nervous, all revealed themselves in writing that included poetry, a mockumentary, podcasts, and film. One shared about the danger of a single story about her neighborhood. Another shared her race experiences in her first slam rap poem. Films dealt with their everyday world–parent relationships, pregnancy, false accusations, and music idols. One by one these youth had developed enough trust to share their worlds and perspectives. GWP dreamed OneCity Stories would give teens from different neighborhoods opportunities to understand each other better through stories about growing up in St. Louis. Race conversations and student choice instilled in them enough trust and confidence to share pieces that enlarge and enrich our understanding of thirteen St. Louis youth. OCS youth will present these stories to middle school writers at the Youth Writing Festival at UMSL on Nov. 9 and at Riverbend School in Pacific, Missouri, on March 2, 2018. May these empowered voices inspire and multiply!